We got a call from Vancouver Paranormal today and it seems like they’ve caught something on film. 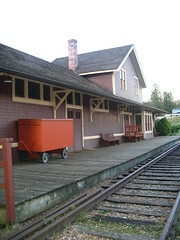 They visited the Museum after hours one night and photographed the Station Platform. When the photo was developed, they saw an apparition of a lady with a hair bun. Just wondering where that photo of the woman is? I’d love to see it. The photo is with Vancouver Paranormal. We haven’t seen it either but we hope to get a peak too. i just spent some time checking out their site with photos and details of various invetsigations. very interesting and intiriguing stuff! Yes, their work is lots of fun! One more group wants to come and investigate but they haven’t set up a date yet.